Lemon Meringue Pie is one of my all-time favorites. 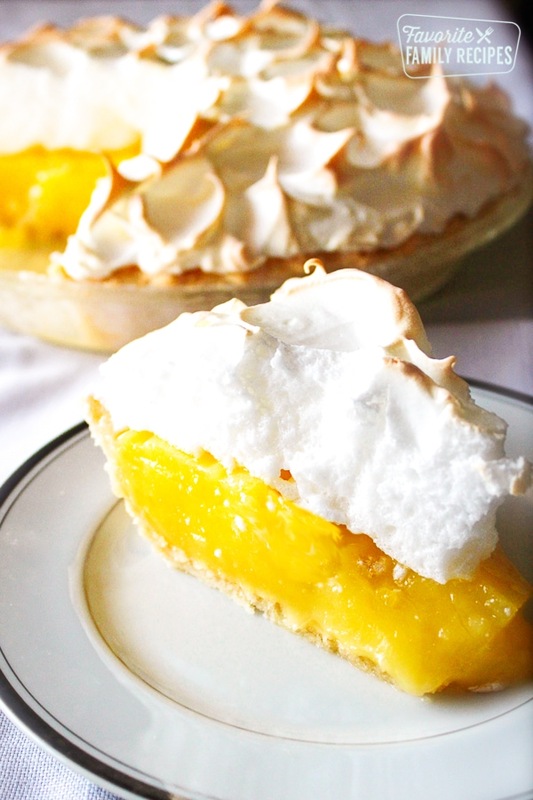 Smooth, tart lemon filling with light and fluffy meringue that melts in your mouth. 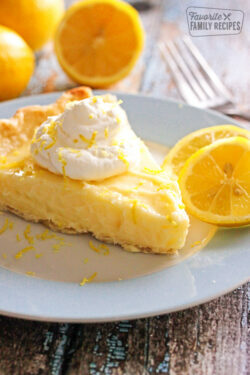 The best lemon pie you will ever taste! This Lemon Meringue Pie is definitely one of our more treasured family recipes from our mom. We grew up on this dessert; it’s been a favorite in our family as far back as I can remember. Our dad always requests it to be one of the pies served at Thanksgiving dinner, many Sunday dinners and it has replaced his birthday cake on more than one occasion. 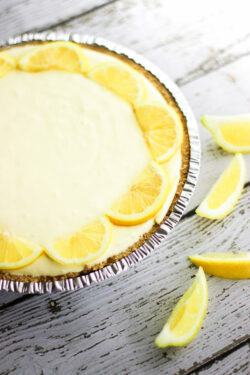 Fresh lemon juice and zest give the filling an irresistible tart lemon flavor. The meringue gets light and fluffy from whipped egg whites that turn a gorgeous golden brown in the oven. It really is the best lemon meringue pie recipe. A store bought pie doesn’t even come close to the deliciousness of this homemade treat. And it’s not as hard as you think to get the perfect meringue peaks. Give it a try! To make the perfect fluffy meringue, whip egg whites to create egg bubbles. Those bubbles will get trapped inside as the meringue cooks. This gives it the light fluffiness that complements the creamy lemon filling to perfection. I like to bake the pie until the peaks turn a light and golden brown. We love this delicious homemade crust which tastes perfect with this recipe. Or save yourself some time and effort and use a pre-baked crust. There are some delicious options out there, both frozen and fresh. For the best lemon flavoring try to use fresh lemon juice and zest. It gives the pie such a vibrant, fresh flavor that goes so well with the light crust and airy meringue topping. But if you don’t have fresh lemons on hand, lemon juice from the bottle works great too! The secret to silky smooth pie is stir stir stir! Stirring the filling constantly while it’s cooking will ensure a flawless smooth texture. Whether you’re baking up pies for the holidays, Sunday dinner, or a celebration, here are some traditional and unique pie recipes you will love! Key Lime Pie – A traditional southern pie in a graham cracker crust. It is creamy, sweet, and tart all at the same time. In a medium-sized saucepot, bring sugar, cornstarch, salt, water, and lemon peel to a boil, stirring constantly. Remove from heat and mix in with wire whip 4 egg yolks. Return to heat for 1 minute stirring constantly. Remove from heat and whisk in 3 T. butter, then ½ c. lemon juice. Pour into pie crust and cool. Meringue topping: In a mixing bowl, beat egg whites and cream of tartar until foamy. Gradually add ½ c. sugar beating until stiff peaks form. Top pie with meringue and bake at 325 about 10 minutes or until meringue is lightly browned. Chill until set. I just found out this is my husband’s favorite pie so thank you for posting this again! His birthday is coming up and I needed to find a good recipe. Turned out fabulous. Thanks for sharing the recipe! Was the lemon filling like the canned lemon filling? homemade is so much better than canned. I’m not sure I am familiar with a “fan” oven..? Can you elaborate? This pie was wonderful! It was exactly what a lemon meringue should be. Thank you for sharing this recipe for us to enjoy! So glad you enjoyed this Lemon Meringue Pie! 🙂 Thanks so much for the 5-stars! You just need regular but you could do deep dish if you would like. Mmmmm this Saturday I make this pie! Good call 😉 This goes SO GOOD with Easter dinner! Would you share your pie crust recipe,, please? 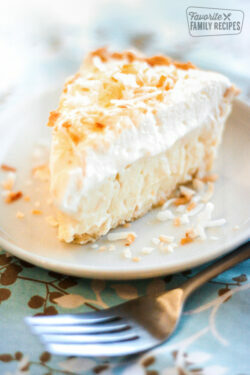 Can this be made into coconut Mirangue pie ? Hmmm I’m sure it could, you could search for “Coconut Cream Pie” on our site and use that filling and then this meringue topping. I am sure it would be delicious! Looks good, gona try to put it togather NOW !!! How many days before Thanksgiving could I make and refrigerate this pie? I’m making 5 pies so I need to do some a few days ahead of time. You could probably do it 2-3 days ahead of time but you will probably want to do the meringue fresh. Just be sure to cover the pies well so they don’t dry out and get gummy. Hope this helps! How long do you cool the pie before adding the meringue? I find Meringue pies get weepy and then crust gets soggy. How do you prevent this? Wait until the pie is completely set – I usually stick it in the fridge for at least an hour. /This is the recipe I used for over 50 yrs from the Betty Crocker Cook Book, 1957 edition. Always so good!! Your mom probably got the recipe from that book also. ha! Crazy! I know she has a LOT of old cookbooks, so you are probably right! I’m sorry but we don’t have conversions to grams.. yet. It is something we are working on. Hopefully we will have it available soon! I just made this pie. I want to say WOW really it is good and beautiful with the tall meringue… Oh a thing of beauty. I will be proud to show it off this Thanksgiving! Thank you for sharing! I’m glad this recipe was a success for you! Thank you! This looks great, but was wondering if it could me made with half sugar and half Truvia. Lemon Meringue is my husband’s favorite, but he’s long to cut back on sugar. Truvia claims to be a 1:1 substitute for sugar so if their claims are correct, you should be fine. Personally I don’t love the taste of Truvia so I think it alters the taste too much, but if you don’t mind, I would say “go for it”! Hope this helps! Is the butter salt or unsalted? Best lemon meringue pie I have EVER made! Thank you for posting this! So glad you liked it! My mom has been making this pie as long as I can remember! Directions were so easy to follow. I used real lemon for the juice and it was a tad thin. I hope it thickens up as it cools. No, we never add food coloring to it. It could be the lighting in the picture as well that gave it a brighter color? Do you need to chill lemon filling in pie crust completely before adding meringue and putting back in oven? Yes, that would be ideal so the meringue doesn’t get too liquidy! Hope this helps! Usually on the middle rack just so it bakes evenly. Hope this helps! Lucy — you absolutely must pre-bake your crust, it is not optional. If not, your dough will be raw. Also, the filling recipe calls for 1 1/2 cups sugar and then another 1/2 cup sugar for the meringue. Mom always made this for Dad on his birthday. It was his favorite! Excellent pie! This is the best lemon meringue pie I’ve made yet! Saving this one! Creamy and not too sweet – did increase the lemon zest a bit. WOW! What a compliment! Thank you, Leigh Anne, for leaving such a kind comment! Haven’t tasted yet, but did lick the spoon and the lemon filling is fantastic. Used fresh squeezed lemon and zest. Hauled out the stand mixer for the meringue and it looks just as it should, although I could have made the meringue design a little prettier. Great recipe and thanks so much for sharing! Thanks so much for the comment! It’s definitely tough getting the meringue just right. I have been making this recipe for years and I still can’t make it as pretty as when our mom does it! The favor was great. The meringue turned out without a hitch. The pie, however, did not set up for us. This was our first time making it and after doing a little research we found that after adding the eggs the time you cook for of one minute may not be as important as knowing to look for the mixture to be very thick. In a trouble shooting article it recommended to thicken it to almost sliceable because when you add the juice it will thin a great deal. I’m gonna try this recipe buy I’m gonna use brown sugar meringue it’s so good!! Oh yum! A brown sugar meringue sounds delicious! my husband is diabetic. this is his favorite pie. my question is: can this lemon meringue pie be made with sugar substitute? Unfortunately we have never made this with a sugar substitute so we can’t say how it will turn out. Many sugar substitutes say that you can substitute at a 1:1 ratio but I don’t know how it will affect the consistency. Sorry I’m not much of a help here! If you decide to try it let us know how it turns out!